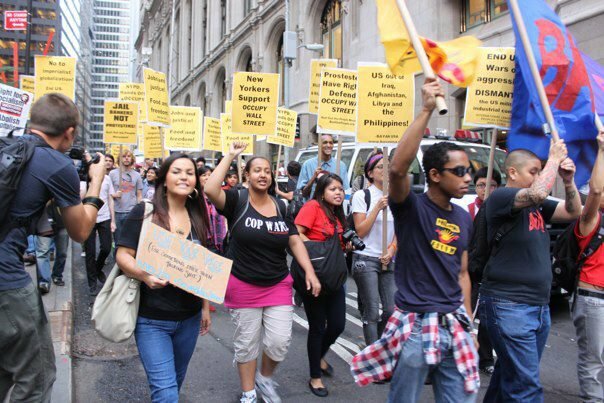 The International League of Peoples Struggle, representing hundreds of organizations in 43 countries, stands with the young workers, students and unemployed occupying Wall Street and city centers around the United States. You are fighting a battle that needs to be fought. You have a right to march and protest without fear of arrest or brutality. You are right to take to the streets in mass action rather than waiting for change from overpaid Republican and Democratic politicians who are on corporate payrolls. You are right to follow the militant path taken by people from Egypt and Tunisia to Greece and Spain, from Britain to Chile to Wisconsin. From Social Security and the 8-hour day in the 1930s to civil rights laws in the 1960s, mass action is the only way people in this country have won any rights from the corporate ruling class. You are right to take the battle to the doorsteps of that class, the unelected tyrants who own the top 500 banks and corporations. Every day, at electronic speed, they send trillions of dollars around the world in financial transactions while millions cannot find work or afford health care. Their decisions shutter factories, destroy jobs, throw people out of their homes and wreck the economies of communities and entire nations. These bankers and billionaires also rake in super-profits from murderous imperialist wars against people in Iraq, Afghanistan, Libya, Palestine and elsewhere. In the U.S., they have created a monstrous police state-prison-industrial complex to lock up mostly youth of color, the children of generations of workers, whom they now deny the right to a job. New York City Mayor Bloomberg, one of the richest men on earth, lies when he says that banks create jobs. His banker pals at JPMorgan Chase and Citibank have destroyed 7 million jobs since 2008. This billionaire parasite is closing schools, bus lines, clinics and libraries while increasing his personal fortune by billions of dollars since he took office. WHERE DID THE BANKERS GET THEIR BILLIONS? They stole them! And not just the bailout money they were given by both the Bush and Obama administrations. The fortunes of the top 1 percent are the unpaid labor of generations of workers not just in the United States but all over the world. It was created in farms and factories, mills and building sites, mines and offices from the Nile Delta to the Mississippi Delta, from South Africa to South Korea to South Carolina, from Mindanao to Mexico to Michigan. Many of the biggest fortunes in the U.S were founded on the slave trade. This wealth belongs to all humanity. It is not a matter of making the rich pay their “fair share.” They have no right to even a penny from anyone else’s labor. We must smash their power over our lives. The source of that power is imperialism, the merger of finance and industrial capital that is plundering the entire world. To fight them we must take a clear stand against imperialism and racism and join hands with people all over the globe who are fighting the same enemy. Both the Republican and Democratic parties represent Wall Street, we have to fight for ourselves. As ILPS Chairperson, Prof. Jose Maria Sison, pointed out in his Keynote Address to the 4th International Assembly this past July, “The Democratic and Republican parties in the US compete as do Coca Cola and Pepsi Cola in flagrantly carrying out the policy dictates of the financial oligarchy and the military industrial complex. Both parties agree on raising the US debt ceiling. And to blunt public protests, they promise to bring down the public deficit, with the Democrats wishing to reduce the tax cuts for the corporations and upper class and the Republicans demanding the further reduction of government social spending.” Everyone on this planet has the right to a job, food, health care, education, a home and a peaceful life. The wealth is there! We created it! But to take it back, we must deepen our struggle, strengthen our unity and increase our organization and continue to fight! A JOB IS A RIGHT! HEALTH CARE IS A RIGHT! EDUCATION IS A RIGHT! A HOME IS A RIGHT! WE CAN GET THEM IF WE FIGHT! 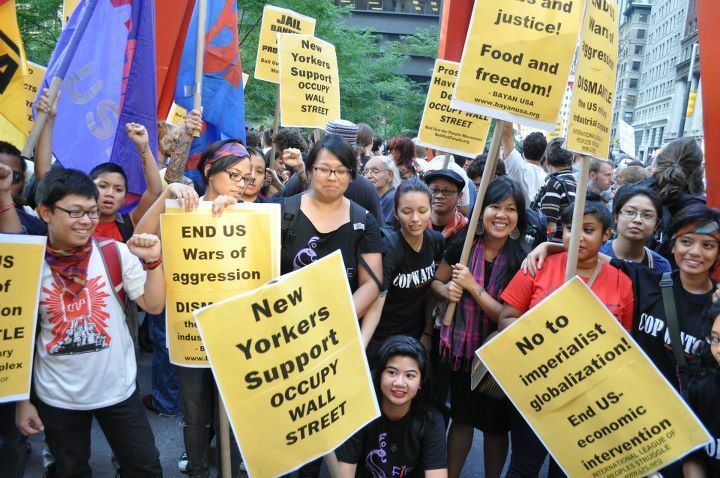 Filipino-Americans across the US, under the banner of BAYAN-USA, salute the historic Occupy Wall Street (OWS) movement in New York City and the surge of solidarity protests that have unfolded across the country and even globally. BAYAN-USA member organizations are amongst those who are proudly marching in the streets of downtown Manhattan as well as in Los Angeles, Oakland, San Diego and San Francisco, under the umbrella call of exposing and opposing the vastly unequal distribution of wealth between the American people and the tiny financial oligarchy of banks and financial firms Wall St. represents. At a minimum, OWS raises the basic question of fairness and equality, and the fact that there are no such principles under the current state of the US economic system. At a maximum, OWS has the potential to qualitatively raise the level of class consciousness in the US that can contribute to the shaping of a broad anti-imperialist united front in the belly of the world’s number one imperialist superpower. Whatever direction it takes, the unraveling of the rotten character of capitalism and its irreconcilability with human prosperity continues to push the angry American people to the realization that to stand against economic inequality is not only justified, but necessary for change to happen. The ongoing decline of the domestic US economy in the form of the liquidation of the public sector, the hyper-dominance of military and prison industries, and the massive multi-trillion dollar bail-outs of big banks such as JP Morgan Chase and Goldman-Sachs is the result of a protracted domino effect from the worsening global economic crisis. This crisis is attributed to the flawed and unsustainable character of monopoly capitalism, or imperialism. Imperialism’s neoliberal economic framework, with its reliance on finance capital, has transformed the global economy into a virtual pyramid scheme of transnational bank transactions and predatory lending, built on risk and speculation versus the real economy. It is the same economic decline that moves the OWS protesters across the US because of rising unemployment and that is chronic to the Philippine economy, driving 4,000 Filipinos to leave the country everyday in search of jobs. As a large immigrant group in the US, Filipino-Americans have a key role to play in exposing that the tyranny of corporate greed is rooted in the system of imperialism that not only impacts our communities here in the U.S., but is the root of the suffering of our people in our homeland and the cause of forced migration of Filipinos throughout the world. This is because of the Philippines’ particular experience as a semi-feudal, semi-colonial outpost for US imperialism, and how Third World poverty is manufactured out of this condition. This continues to be apparent under the regime of Benigno “PNoy” Aquino III, whose neoliberal economic agenda has turned the Philippine economy into one dependent on foreign investment rather than on its own domestic production as a nation. Without a Philippine economy that is nationally sovereign– including a genuine agrarian reform program that is equitable for the majority of the Filipino people who live off of it and a genuine program for national industrialization that can provide jobs so Filipinos don’t have to look for them abroad– the Philippines will remain tied to a rotten global economic system that is showing clear signs of decay, causing more burdensome misery for the Filipino people. As with all other pyramid schemes, this one too is destined to collapse. But the timing of this collapse can be hastened by a broad mass movement determined to knock it down and build a better alternative. Just as the people’s movement in the Philippines for genuine national independence and democracy espouses a vision for socialism as a viable and pro-people alternative, as are governments in Latin America asserting their sovereignty by nationalizing their industries and natural resources, so must the American people fight for an alternative economic system that not only puts people’s needs over profits, but one that is not built on world hegemony and the destruction of other nations all over the world. 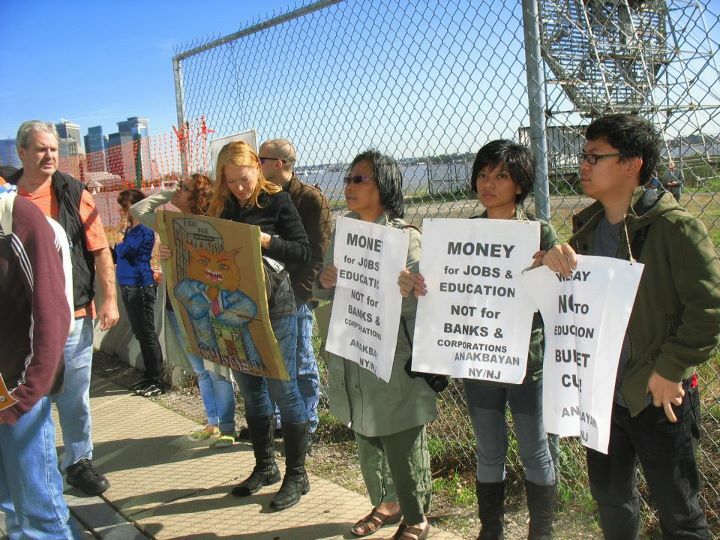 BAYAN USA joined forces with the local citywide anti-budget cuts network known as the Bail-Out the People Movement (BOPM), which helmed the march and rally in response to the mass arrests and police brutality against the otherwise peaceful and non-violent occupiers last Saturday. They were also joined by the People’s Justice Coalition for Community Control and Police Accountability, a grassroots network of low-income immigrant and people of color groups against police brutality. Instances of excessive violence and pepper-spraying from the NYPD caught on videotape has since sparked a massive outcry from the international community and drawn support for Occupy Wall Street from high-profile personalities such as filmmaker Michael Moore, actress Susan Sarandon, and academic Dr. Cornell West. 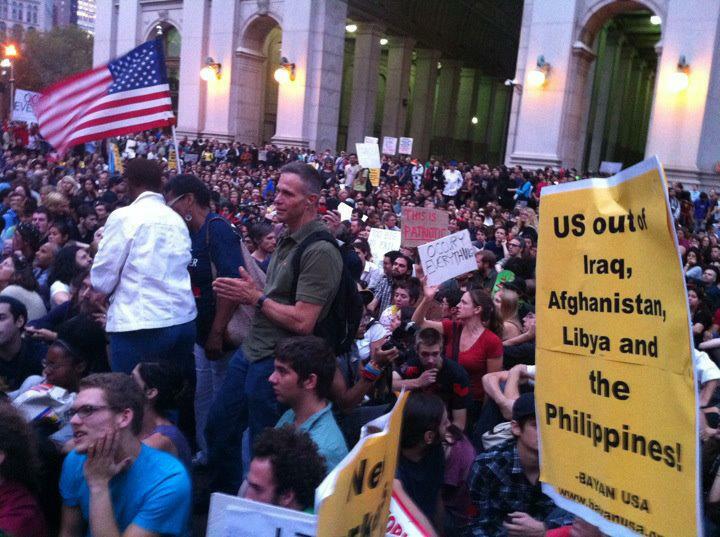 The messages carried by BAYAN USA, joined by the flags of GABRIELA USA and the International League of Peoples Struggle (ILPS), projected issues of US foreign policy in poor countries such as the Philippines, and sought to relate the occupiers’ initial message against corporate greed with the international context of neoliberalism and war, and the situation of forced migration to the US. It was also the first time since the beginning of the occupation that an organized contingent of mainly immigrants and people of color with clear anti-imperialist messages joined the protests. 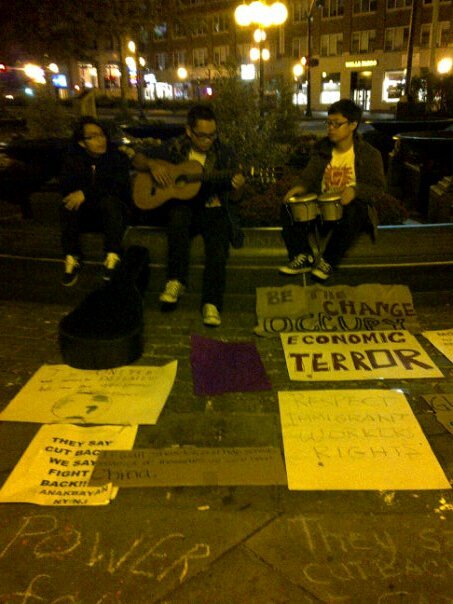 Due to the absence of a sound permit, the lack of a sound system did not deter the demonstrators from practicing a so-called “peoples mic”, a practice in which the crowd repeats what the speaker says. With such a sizable crowd yesterday, Ellorin had to wait as her words traveled some 4-5 times to reach everyone.